Doolin Town is located in the West of Ireland in County Clare. 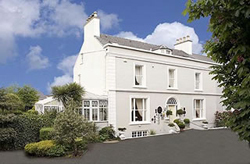 Situated on the outskirts of the Burren Region. Doolin is the closest port to the Aran Islands and a passenger ferry service operates daily from Doolin Pier during the months of April to October. Just four miles south of Doolin are the Cliffs of Moher, the visitor centre is open all year round. Doolin is also on the outskirts of the Burren Region, an unique limestone area - an explorers paradise. Doolin is renowned as the music capital of Ireland. It is home to many traditional musicians. Traditional music is a nightly entertainment in the world famous pubs in the village of Doolin. Aeroplane: Shannon Airport is the closest airport to Doolin Town - 67km. Click here for details on Irish Airports. Sorry there is currently no listings for Doolin.